I can't find the words right now to describe how good this is. There are the pictures where you can see that it looks REALLY tasty. That helps. And I could tell you that the Mr. said it was the meatiest tasting vegan burger he's ever had. And the best one he's ever had. That may add to the description for you. Right? Or what if I tell you a little secret: one day I ate nothing but these burgers. I had one for breakfast, then one for lunch and then one for dinner. I'm not even kidding. And since I'm sitting here writing about them and staring at the pictures I'm feeling like I could have another one right now. These burgers have some quailities that I was searching for while making the perfect burger: They are sturdy. They don't crumble when you flip them. I haven't tried grilling them but I would be far more confident trying to grill these than any other veggie burger I've made. They are not at all squishy on the inside (yuck!) I hate when bean based burgers taste like a paste in your mouth. That's not what I'm looking for when I'm wanting to eat a burger. These have a wonderful "meaty" texture. They have a really good grilled flavor without being grilled and without being overpowering. Thank you BBQ sauce for your smokey goodness! Oh and they are not at all dry. Yahoo! And that was accomplished without the use of any added oils. I know, crazy talk! In fact, I think that I can see that we are going to need to keep a batch of these in the freezer at all times. Oh and once it is full on Summer? These are going to every single cookout that we go to. And I am going to make some double batches because I know that other people will want to try them once they smell how amazing they smell while cooking! Alright, so one more thing: I give you the option of using TVP granules (textured vegetable protein) or tempeh. We liked both equally well but I feel better about eating tempeh than I do TVP. It's far less processed and I can get it from a local organic manufacturer, which is a sweet bonus. Use whichever you prefer! Oh oh I lied. Two more things and this is the last one: BBQ sauce. Trying to find some good BBQ sauce without corn syrup in it is super hard. I need to get a recipe up for some but in the meantime you can do a quick google search OR if you want to buy it (I do most the of the time!) I highly recommend getting the BBQ sauce from Trader Joe's. It's awesome. If you don't have a Trader Joe's you are going to be spending some extra time flipping over the bottle from every single brand to find the good stuff but it is out there sometimes - it just depends on your region! The recipe calls for cooked brown rice. I usually cook a HUGE pot of rice and then freeze it in family sized portions so that I can quickly thaw some out instead of having to take the time to cook some. If you don't have some leftover brown rice make sure you make extra time to do that before you make these. And make extras so you can always have some on hand! Dealing with tomato paste: take out the tablespoon you need and then get a baking sheet and line it with parchment paper or freezer paper. Scoop out the remaining tomato paste in 1 Tablespoon increments and blob them onto the paper. Freeze until solid and transfer to a freezer safe bag. Now you can just pull one out when you need it and throw it into soups, burgers, dressings, or whatever else! This method is also perfect for chipotles in adobo sauce. Update! 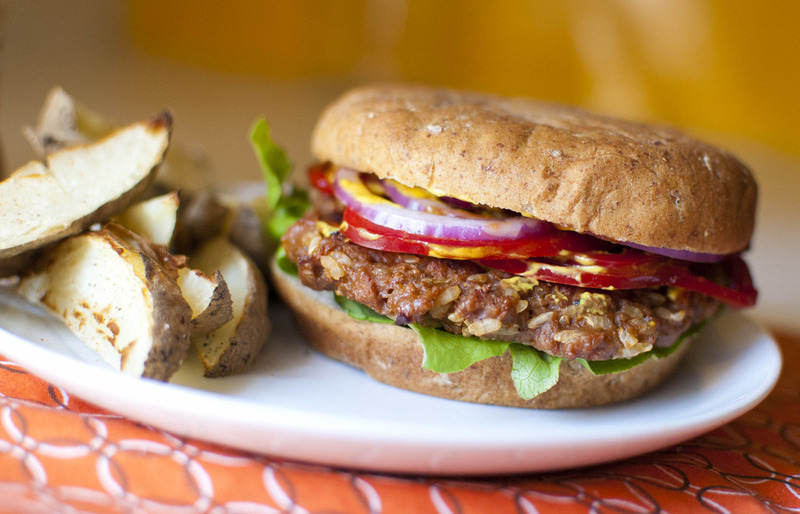 - I used 1 cup of lentils instead of tempeh and it worked great! 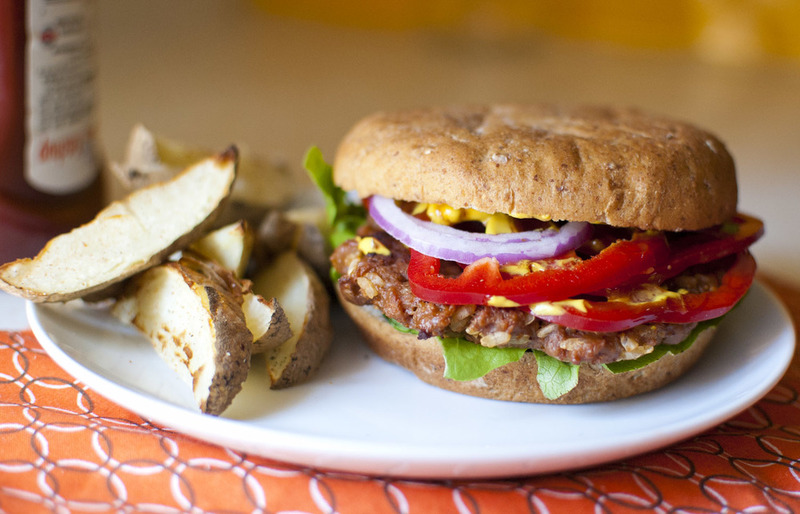 If you are using tempeh you may want to steam it before adding to the burgers. Steam over a pot of boiling water for about 10 minutes. Then set aside to let cool. Once it's cool chop it up until it is pretty fine - about 1/4" pieces max. It should crumble up a bunch and that's good! If you are using TVP you want to heat up your vegetable broth until simmering and add it to the dry TVP granules. Let it sit until it has absorbed all of the liquid. Set a large nonstick skillet over medium high heat and add your onions. You may also want to add a few tablespoons of water to keep them from sticking to the pan. Cook until they are nice and translucent. Add the minced garlic and cook for 1 minute longer. Add to your tempeh or TVP and let cool. In a separate bowl mix together your vital wheat gluten, flour, nutritional yeast, and grill seasoning blend. Mix the BBQ sauce, tomato paste, soy sauce and rice with your tempeh or TVP mixture. Then add that to your dry mix. Stir to combine and then knead for a minute or so. Separate your mixture into 6 patties and place on the parchment lined baking sheet. Bake for 15 minutes and then flip. Bake for an additional 15 minutes. Grill Option!! : grill over medium hot coals for 10 minutes on each side!! SUPER YUMMY!